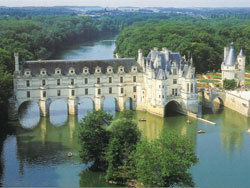 Located in the central region of France, Tours is a well preserved jewel of French History. The “City of art and history” was the capital of the French Kingdom in the 15th and 16th century. Tours is crossed by the Loire River, a place that has been sparking numerous artists’ inspirations throughout the times. Tours is also famous for its “art de vivre” (art of living) thanks to the architecture of its many magnificent monuments, its mild climate (important for wine production), as well as its world-renowned gastronomy.